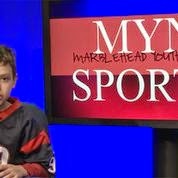 We taped our final show of the academic year today, which means we successfully completed a 4th season of Marblehead Youth News. Like always, today saw kids having first experiences and kids experiencing the comfort that comes from practice: all were pros in one way or the other! For me, today meant the end of an amazing, surprising, challenging, hilarious and ultimately wonderful time creating and producing this excellent show. 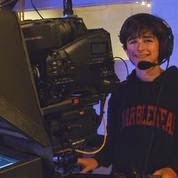 Throughout these four years, I have learned as much if not more than every kid who walked into the MHTV studios, and not so surprisingly, I have learned the most important things from those very same kids. Each and every one. Ideas grow in environments of supportive people, but they even grow in ones less supportive. Add your idea no matter what and see what happens! More often than not, one wonky idea may lead to 3 or 4 even better ones that would never have been dreamt into reality without that first wonky one. If someone asks, "teleprompter?" and you don't even know what that is, say yes. Your brain and your bravery will grow in such amazingly powerful ways when you take on something you know nothing about. Mic never worked? Hit the wrong button when recording? Cued the wrong camera? Flubbed a line? Did the world end? No? Pull yourself up, reconfigure the camera, straighten your gaze and try again. It might be 24 hours until you have to create a television show, with no crew and very little content. If you can believe that people are good always and that those good people will show up, you'll be okay. Cultivate good people in your life and keep the faith that your efforts matter and resonate. Thank you so much to the Joan, Jon and James (and those on earlier MHTV staffs) who have been such an insurmountable support to me and all the children and parents of MYN. Their commitment to community is of the highest level and we should be profoundly grateful for all they do, every day. I am and always will be. Thank you to all the parents over the years who have learned new technologies, helped to develop last minute scripts, hustled to interviews and waited in green rooms, endlessly. I salute you. THANK YOU to every kid who ever took a chance, held a camera or a mic, pitched a story, edited film, directed a show, sat at the anchor desk and smiled, smiled, smiled through each and every moment. I saw you, we all saw you, and I can promise that if you keep the effort and enthusiasm you've showed here and apply it to whatever it may be that you love, you will be okay and probably even fantastic. I can't wait to see your next episodes, on screen or somewhere else. I will be tuning in to MYN and all the MYN kids. Always. SEASON 4 COMING A CLOSE! We're almost at the end of our fourth season -- and what a great one it has been! Please come to our next brainstorming meeting scheduled for Tuesday May 19th 3:15pm at MHTV. We'll make assignments for our final show of the academic year (which will tape June 16th) and discuss options and strategies for the upcoming year. This will be an important meeting, and probably brief, so please try to make it! 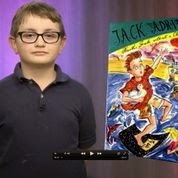 Our latest show, airing now on our regular schedule (scroll down to find air dates) examines some of the many ways Marblehead kids use technology for fun, learning, communicating and entertainment. 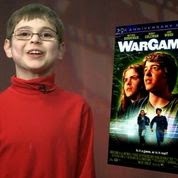 The kids were pretty psyched for this "themed" episode and we hope our viewers will appreciate this uniquely kid-centric take on what life is like for kids in our "connected" world. We also want to thank a former Marblehead kid (now a grown up), Katie LeClerc Greer who shared her expertise on internet safety with two MYN reporters while waiting for a flight at JFK in New York. We had FaceTime to thank for that! Please come to our next Brainstorming meeting -- January 20th, 3:15 at MHTV -- maybe there are other themes we should explore? Conor and Aidan (also cousins) anchored like champs. Lucas was a pro at floor directing. 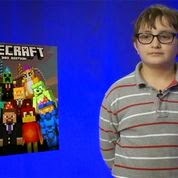 Luca taught us about the fun and learning in Minecraft. Cameron ruled the Tech Director position -- and had a lot of fun with the buttons! 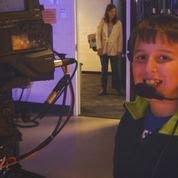 Charlie stepped up last minute to operate the teleprompter! THANK YOU CHARLIE! 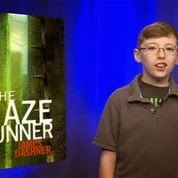 Check out ace reporters Haley, Kipp, Porter, Tucker and more for this very cool and educational MYN episode! Share our schedule with your friends and don't forget to like our Facebook page.